Dutch Bangla Bank Ltd. SSC Scholarship Circular 2018: DBBL Scholarship 2018 For SSC Passed Students Published on 7th May, 2018. Dutch Bangla Bank SSC Scholarship Notice Published at DBBL official website. Dutch Bangla Bank SSC Scholarship Result Will be Found Here. Dutch Bangla Bank SSC Scholarship 2018 Application Will be Start From 8th May 2018. Dutch Bangla Bank SSC Scholarship Application 2018 Will be End On 8th June 2018. Dutch Bangla Bank SSC Scholarship 2018 Application Will Start From 08 May 2018 and The Application Will Continue up to 08 June 2018. So You Can Apply for Dutch Bangla Bank ltd SSC Scholarship 2018. Details Information Are Given below. To Apply For Scholarship Students must be Passed SSC or Equivalent in 2018 with at least GPA 5.00 for City Corporation Area Colleges, GPA 4.83 For Out Sides of City Corporation Area Colleges. GPA Will be Count Without 4th Subject. 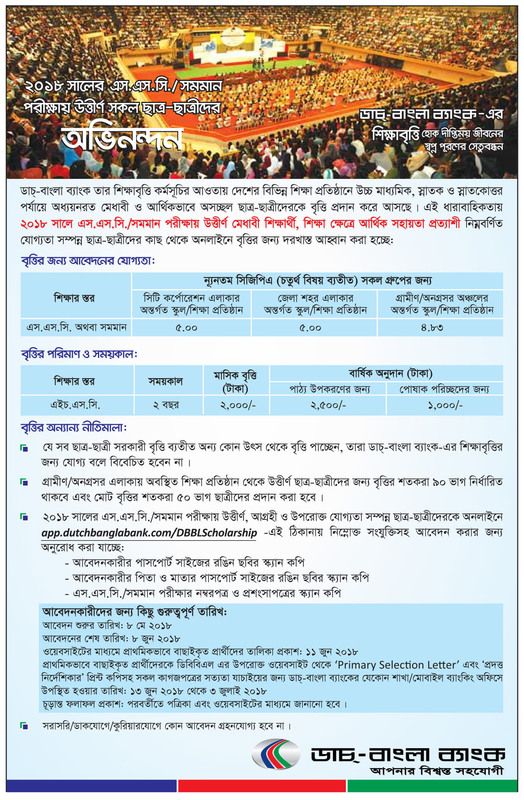 See Details About Dutch Bangla bank ssc Scholarship Notice. Every Year DBBL Foundations Invites Scholarship For The SSC, HSC and Graduation Level Passed Students. DBBL Support Brilliant Students to Continue Their Study. Dear Student, DBBL Primary Selection Scholarship result of SSC 2018 batch Will be Published 11 June 2018. We Also Published Dutch Bangla Bank SSC Scholarship Result 2018. Result Are Given Below. All or Final Result Are Found. SSC Scholarship Final Result Will be Published Later. and The Date Will be notify by Daily Newspaper and DBBL website. Preliminary selection list has been prepared based on merits of the applicants comprising examination results in SSC, scholarship in JSC and PEC (if any); and parent’s level of income and profession etc. DBBL Invite SSC 2018 Passed Students to Apply For Scholarship Program. Every Year Dutch Bangla Bank give Scholarship For Poor but Meritorious Students. Scholarship Period Will be Valid For 2 Years. Students Will be Get 2,000 Taka Monthly and 2500 Taka For Reading Materials and 1,000 for Cloths in Annual.